Sometimes in life we have to make some really tough decisions... this isn’t one of them, but still, I think it ranks high enough to call for a bit of advice. The other night I went shopping in Cardiff as you do, not really looking for anything in particular, but then I wandered into Topshop and started looking at the shoes... dum dum dummmmmm ! I found two pairs I absolutely love, they were both the style I was looking for and looked similar to a pair I had wanted a little while ago but they had stopped selling. Now, I’m not very good at making decisions as it is, and it didn’t help that both shoes were leather and very reasonable priced, only between 30 and 35 pounds.... what a frickin’ bargain! I can’t seem to find them on the Topshop website, at least not in these colours, so I can’t link them I’m afraid. So my friends, which ones would you keep? Or would you just keep both? Let me know, help a very indecisive woman out! I thought the navy ones were black so I would have said those ones, but now that I know they are navy I say keep the beige! Especially if they fit better, that is the most important part. we know how you feel! 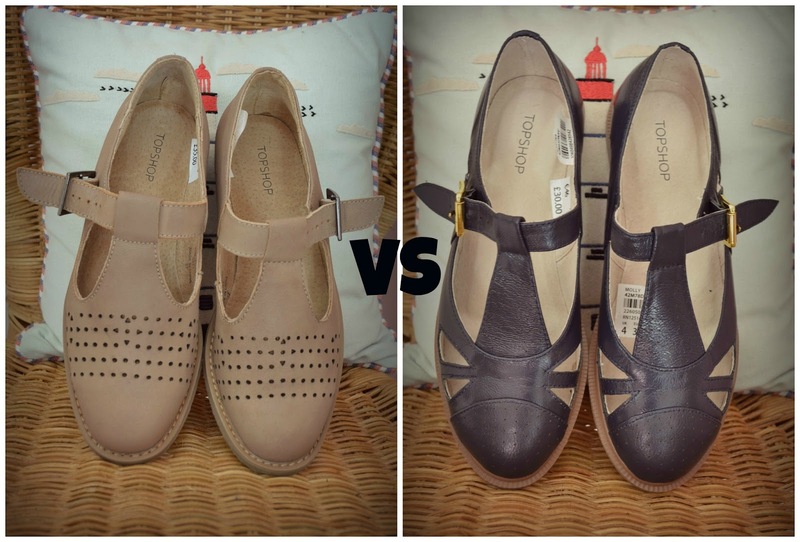 If we had to pick between the 2 we'd go with the second becuase it is alot more versatile therefore you'll get more wear out of them. But who are we kiding?! keep them both!! i really love the beige ones!